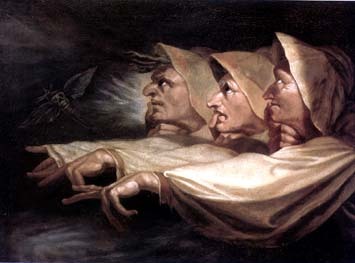 Henri Fuseli, The Three Witches (1783). "Barnett’s work is striking and raw … flooded with imagery, both beautiful and haunting, grotesque and serene. … A stellar and inspiring new piece of theatre with cultural and gender relevance is being unveiled at Venus Theatre, and this is the moment to take the opportunity to come and see it." "Underlying Witches Vanish, the new play by Venus Theatre Company, is a cold bedrock of fact: A tremendous amount of women are missing. Oftentimes just a blurb on the evening news, these women all have personal histories, family and friends, and a vibrant emotional life that is rarely portrayed. Playwright Claudia Barnett never lets us forget this basic truth … "
"Inspired by history and legend, Barnett's stunning script conjures the stories of real women and girls gone missing from all over the world, witnessed by the three witches from Macbeth. … The voices of lost women and girls everywhere have migrated into the light through Barnett's beautiful words." Tara Cariaso in the Venus Theatre production of Witches Vanish. Photo by Curtis Jordan. Witches Vanish was developed through the Downstage Left development program at Stage Left Theatre, Chicago, and had a workshop production as part of LeapFest 9: A Downstage Left Festival of New Plays, May 15-June 3, 2012. Scott Bishop directed. The cast of the MultiStages New Works Finalist Festival reading. Witches Vanish was a finalist in the MultiStages 2013 New Works Contest and had a staged reading in the MultiStages New Works Finalist Festival in New York on January 20, 2014. Melissa Maxwell directed. Witches Vanish had a staged reading at 8th Annual Women’s Work Festival in St John’s, Newfoundland on March 4, 2014. Mary Vingoe directed. Witches Vanish had a PlayLab reading at the 9th Annual Great Plains Theatre Conference in Omaha, Nebraska, on May 26, 2014. Julia Hinson directed. Leticia Monet and Jennifer Berry in the Venus Theatre production of Witches Vanish. Photo by Curtis Jordan. Venus Theatre presented a staged reading of Witches Vanish at the 13th annual Page to Stage New Play Festival at the Kennedy Center for the Performing Arts in Washington, DC, on September 1, 2014. Deborah Randall directed. Witches Vanish premiered at Venus Theatre in Laurel, Maryland as part of the Women's Voices Theater Festival: August 20-September 20, 2015. Deborah Randall directed, with masks by Tara Cariaso. Witches Vanish was included in Borderlands of History: Gender, Violence, Memory, A Staged Reading Series, at the University of Pittsburgh, on March 18, 2016. Shelby Brewster directed.